With their green perfection, stunning natural settings and world class amenities, the courses of St. Johns are among the finest in the world and perhaps one of our communities greatest assets. Palencia is an 18 hole Arthur Hills-designed championship golf course. Shaped by the natural beauty of the land, this 7,071 yard masterpiece winds through centuries-old maritime oak trees and along the Intracoastal Waterway and the Tolomato River. The golf course practice facilities are heralded by one and all for the spacious 10,000 square feet of putting surfaces, 400 yard double-sided driving range along with a short-game area to fine tune the chipping and bunker play. Established in 2002, the golf course had earned the honor of being an Audubon Sanctuary honoring the beauty of nature, pristine views of magnificent marsh and river views as well as blending gracefully into the Palencia “best of class” community. The Ocean Course and Lagoon Course—located on-site at the Ponte Vedra Inn & Club—each feature a distinct seaside links flavor. Meandering lagoons, undulating fairways, elevated Bermuda greens protected by steep-faced bunkers and a prevailing sea breeze provide for every kind of shot making challenge imaginable. All fourteen clubs are required here! Arnold Palmer and Ed Seay designed and built this majestic par 72, signature championship golf course. The course presents a mix of demanding par fives and three signature par threes along with a variety of doglegs left and right and an island green at the 15th Hole. Five sets of tee placements that range from 5,058 to 6,940 yards provide golfers of every level the opportunity to challenge themselves and enjoy their round at the same time. There are 58 bunkers and on 16 out of the 18 holes water comes into play. Practice makes perfect. With two putting greens, three chipping areas, a full driving range, and a teaching complex you have every opportunity to fine tune your game. Director of Golf, Nancy Maunder, a former LPGA player and award-winning golf instructor, leads a team of talented golf professionals ready to help members enjoy every round of golf. A quick stop at our new Pro Shop and you’ll see the latest in golf wear and equipment. It is no wonder why The Plantation players are always dressed to the nines. 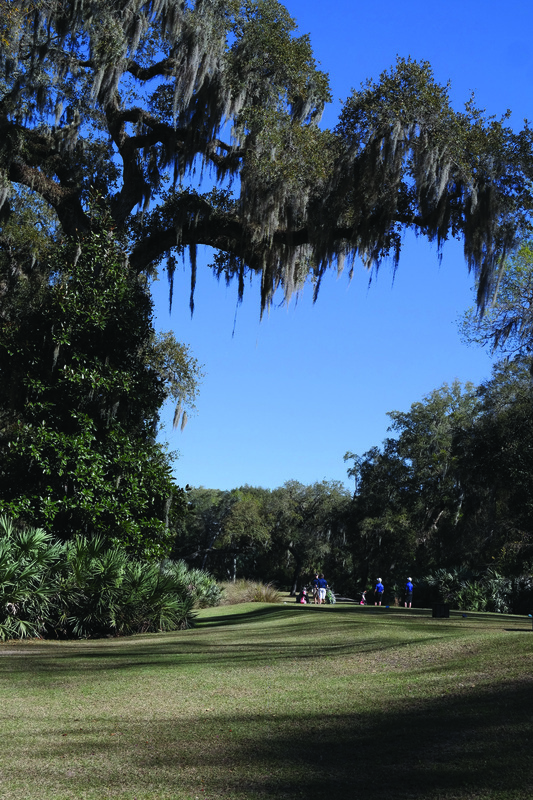 Located in the relaxed and well-developed Southeast section of Jacksonville, FL, the 18-hole course was built to make the title of Champion meaningful. The well-manicured condition of the course extends the luxuriant feel you get the moment you drive onto the club grounds. The Club House is reminiscent of Spanish Colonial Revival architecture, and remains in stately condition outside as well as inside. Inside are all the amenities you expect from a golf club from the golden era of Jacksonville. Home of the PGA TOUR’s headquarters and THE PLAYERS Championship, TPC Sawgrass was built to challenge the world’s best professionals, while at the same time providing the avid golfer and fan with the ultimate golf experience. Located in Ponte Vedra Beach, Fla., between Jacksonville and historic St. Augustine along the Atlantic coast, TPC Sawgrass is about a half-hour away from the Jacksonville International Airport. Designed by Pete Dye and intended to give TOUR players a course to call their home, THE PLAYERS Stadium Course is home to three of the most challenging finishing holes and one of the most photographed holes in the world – Hole 17 and its iconic island green. THE PLAYERS Stadium allows golfers to access a level of play typically reserved for PGA TOUR players. Personal forecaddies educate players on the history and heritage of TPC Sawgrass and provide traditional services to enhance the TPC Sawgrass experience. Designed by Pete Dye, along with Bobby Weed, Dye’s Valley Course boasts similar design qualities to THE PLAYERS Stadium, including spectator mounding, water on all holes and native oaks, pines and palms, making Dye’s Valley one of the most challenging and enjoyable courses to play. Shorter in length, but just as compelling, Dye’s Valley is the host of the Web.com TOUR Championship. Golfers enjoy use of TPC Sawgrass’ world-class forecaddies from October through May on Dye’s Valley. 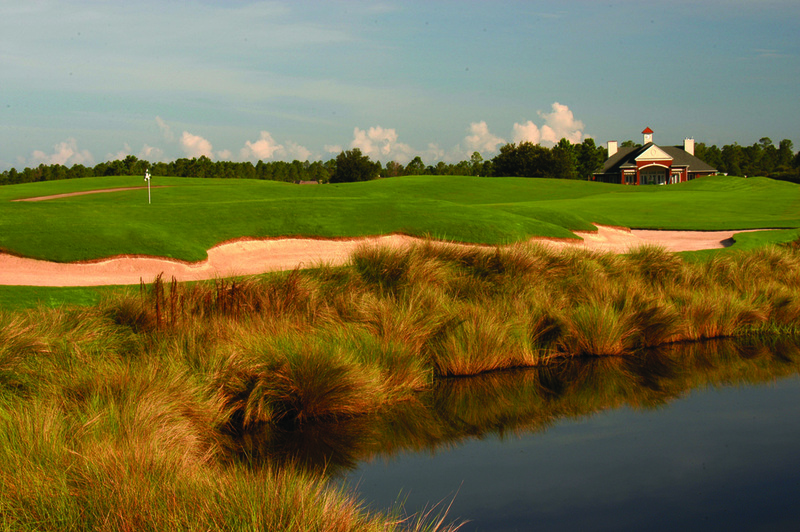 Renaissance World Golf Village has two unique championship golf courses, including King & Bear – the only course ever co-designed by Arnold Palmer and Jack Nicklaus – and Slammer & Squire, designed with input and inspiration from legends Slammin’ Sammy Snead and Gene “The Squire” Sarazen. Enjoy amenities like chilled apples on the first and tenth holes and complimentary range balls. Improve your game with personalized lessons from the pros at our PGA TOUR Golf Academy. And experience the one-and-only World Golf Hall Of Fame, providing an intriguing look at the legends and legacy of golf’s greatest players. “Full Swing Golf,” heralded as the world’s finest indoor golf simulator, is another amenity available to our guests. This interactive teaching tool provides superior technology and unmatched realism, letting you play, practice and learn on simulated greens of 22 top-ranked courses. As the Official golf courses of the World Golf Hall of Fame, King & Bear and Slammer & Squire at World Golf Village are award-winning championship courses designed to offer both enjoyment and challenge in a spectacular and unique resort setting. 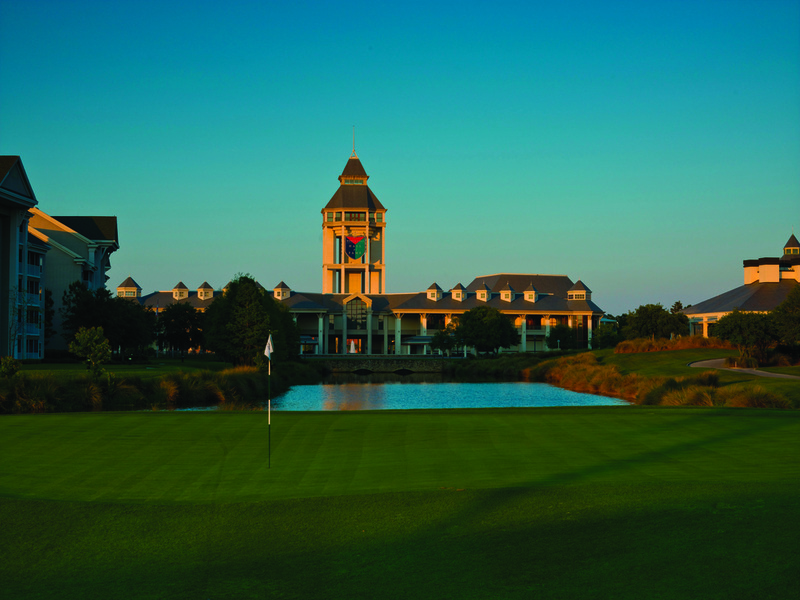 Tee off from under the tower of the World Golf Hall of Fame at the Slammer & Squire. This 6,939-yard course was designed by architect Bobby Weed along with Hall of Fame Members, Sam Snead (the “Slammer”) and Gene Sarazen (the “Squire”). All three men shared a desire to build a course that rewards good shot making while preserving the area’s natural beauty. What developed is a well groomed course that showcases the pristine unspoiled wooded areas, wetlands and natural beauty of the region. The layout is wide open with several contoured greens. A few water hazards come into play, but the picturesque views of the Hall of Fame will definitely overshadow any challenges you may face. The King & Bear is the only golf course in the world that has been co-designed by Arnold Palmer and Jack Nicklaus. This course offers a mixture of two different design styles that come together to form one masterpiece. The front nine is an open, links-style layout that gives a nod to the heritage of the historic city of St. Augustine, Florida. The back nine is more traditional Florida golf fringed with loblolly pines, 200-year-old oak trees, indigenous coquina rock, and numerous water features. With 7,279 yards, it’s a “driver’s” course, which should come as no surprise, as both Palmer and Nicklaus wielded awesome power games in their primes. Since opening in 1999, The Golf Club at South Hampton, a Mark McCumber masterpiece, has been a favorite of Florida golfers. With 16 large lakes, over 60 contoured bunkers, and towering pine and oak trees, this par 72 course provides the right balance of risk and reward for all skill levels. South Hampton provides six tee boxes giving everyone the opportunity to enjoy their round of golf. Yardage ranges from 6,935 yards for low handicappers, down to 2,862 yards from the family tees. The Golf Club at South Hampton also offers you great facilities before and after your round with its world class practice facility to sharpen your game, and the 19th hole where you can kick back and relax after your round of golf. With its meticulous landscaping, superb practice facilities and courteous staff, The Golf Club at South Hampton is the course for you. In March of 2012, The Golf Club at South Hampton was purchased by the DiStefano Family and is now family owned and operated by their company, DWA Golf. In their efforts to grow the game, the goals of DWA Golf are to provide its members and guests with great course conditions, personable service, community oriented initiatives, and a family like atmosphere. St. Johns Golf & Country Club is an extraordinary place located between St. Augustine and Jacksonville, Florida. The 18-hole Clyde Johnston-designed course is the community’s centerpiece with just the right amount of challenge for novice and avid golfers alike. A great place to hone your skills, St. Johns is known for its consistent quality of service and conditions, being nationally ranked for customer satisfaction and loyalty by the National Golf Foundation, and host to the PGA TOUR Qualifying School in 2004, 2006, 2007, 2008, 2009, 2011, 2013 and 2014. World-Class Golf in Northeast Florida! Conveniently located just off I-95 and ten minutes from the World Golf Village, Cimarrone Golf Club is the perfect location for your next round of golf. The spectacular golf course and friendly, knowledgeable staff will make your round at Cimarrone one to remember. Come see why Cimarrone Golf Club is a favorite choice among Jacksonville residents and tourists alike! The service at Cimarrone Golf Club exceeds the highest of expectations. From the golf professionals to course hosts, catering staff and event planners, the entire staff at Cimarrone Golf Club is committed to providing you and your guests a day of golf and fun that won’t soon be forgotten!